Have you ever wondered which bull breed you should use in your operation? How do you make the right choice that will align best with the type of cow you own and your goals? These are common questions from producers. You cannot look at the registration papers of bulls from two different breeds and make accurate direct comparisons of expected progeny difference (EPD) traits because every breed has a different scale and base for each trait. Fortunately, researchers at the U.S. Meat Animal Research Center (U.S. MARC) in Clay Center, Nebraska, publish annual adjustment factors so EPDs can be compared across 18 beef breeds. Refer to the 2017 Across-Breed EPD Adjustments for the complete 2017 Across Breed Adjustment table. After applying the adjustment factor to an EPD, the resulting value is called an across-breed EPD (AB-EPD) and allows for comparison across breeds. The AB-EPDs are most valuable to commercial producers in terminal crossbreeding systems. Crossbreeding allows producers to select the breeds that will work most beneficially on the ranch and increase heterosis of the resulting calves. By deliberately planning a breeding program, producers can work toward their end goals and produce calves that will be desired by order buyers. The producer is best served by picking the breeds he or she wants to utilize, then selecting for individuals within the breed that can meet the producer's goals. This is where the AB-EPD calculation is valuable. 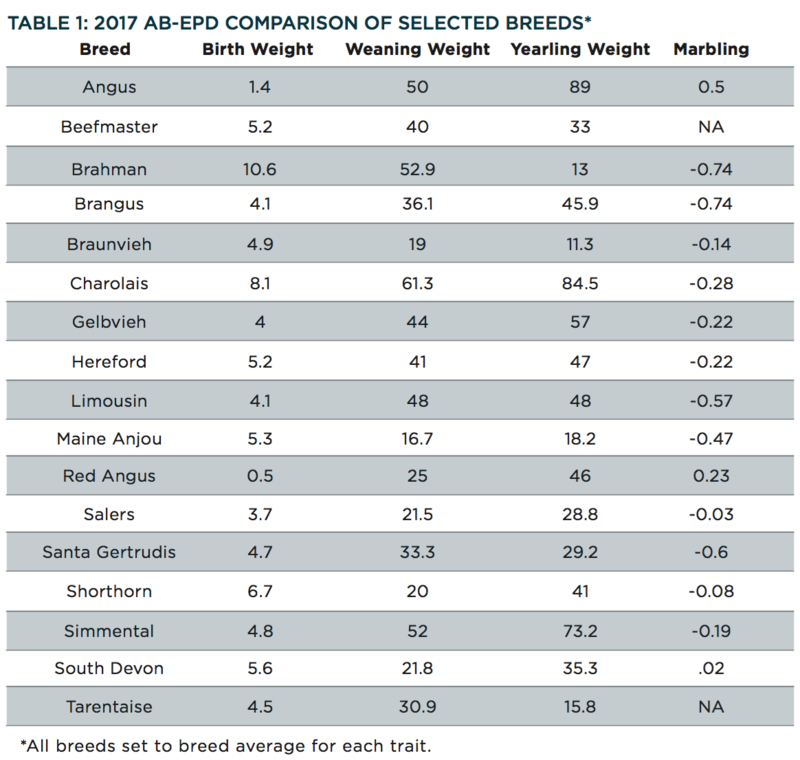 Table 1 provides analysis on birth, weaning and yearling weight, and marbling score AB-EPDcomparisons of most breeds that are evaluated at the U.S. MARC. Each breed was set at breed average of each trait for comparison purposes. A producer has an Angus-based commercial cow herd and would like to sell terminal feeder crossbred calves. The producer wants to know which breed to use to increase the calves' weaning and sale weights after a 60-day preconditioning program. For the purposes of this article, we will assume the producer has access to bulls from Charolais and Gelbvieh sire breeds with both bulls being ranked in the 50th percentile of the breed for weaning and yearling weight EPDs. The calculation is demonstrated in Table 2. The Charolais and Gelbvieh bulls have weaning weight EPDs on their registration papers of 27.3 and 67, respectively. The adjustment factors from the U.S. MARC table are 34 and -23 (found in the table at bit.ly/2017epds), respectively for the Charolais and Gelbvieh bulls. The weaning weight AB-EPD for the Charolais bull would be 61.3 (34+27.3) and 44 (-23+67) for the Gelbvieh when mated to the Angus-cross cow. In this scenario, with similar quality bulls, the Charolais bull has a 17.3 pound weaning weight advantage over the Gelbvieh bull. Likewise, the same calculation would be performed for yearling weight AB-EPDs. The Charolais and Gelbvieh bulls have yearling weight EPDs on their registration papers of 50.5 and 92, respectively. The adjustment factors from the U.S. MARC table are 34 and -35, respectively for the Charolais and Gelbvieh bulls. The yearling weight AB-EPD for the Charolais bull would be 84.5 (34+50.5) and 57 (-35+92) for the Gelbvieh when mated to the Angus-cross cow. In this scenario, with similar quality bulls, the Charolais bull has a 27.5 pound yearling weight advantage over the Gelbvieh bull. Therefore, to meet the producer's goals of selling black-hided, crossbred calves out of Angus-cross cows, the producer would use the Charolais bull since it has a 17.3 pound weight advantage per calf at weaning and a 27.5 pound advantage if the calves are taken to yearling age. If the producer bred this bull to 25 cows, the Charolais bull would have a 432.5 pound increase in total production at weaning and a 687.5 pound increase at yearling age. It's important to note that breed associations re-evaluate and adjust EPDs at least semiannually. Likewise, the U.S. MARC generates new adjustment factors for each breed annually. The across-breed EPD adjustment factors are released at the annual Beef Improvement Federation meeting each summer. Therefore, it's important to use the most current data available when using EPDs and/or the adjustment factors. Of course, there are other factors a producer should take into account when making bull selection decisions. Careful consideration should be given to live birth weights. What amount of discounts or premiums will be received for a certain breed? Will a discount on a certain breed offset any weight gains that can be achieved? Does the producer want to retain ownership into the feedyard and sell to the packer? If so, marbling score would become more important. There is also the pride of ownership aspect. Does the producer just prefer a certain breed over another, or is there a family history of raising a specific breed? Breed selection is not an easy choice to make and should be done with all variables thought out before writing the check for any bull or cow.